The cost of today’s lithium ion battery constitutes a very large fraction of the total cost of electric vehicles, and a very visible portion of the total BOM (bill of materials) cost for a mobile device. It is estimated that the battery pack for a Chevy Volt costs nearly $10,000. That’s nearly 25% of the total price of the vehicle. It’s no wonder that the CEO of Fiat, Sergio Marchionne, requested earlier this year that customers stop buying his electric version of the Fiat 500 because he is tired of losing $14,000 on each vehicle. The small battery of a mobile high-end smartphone from the top mobile device manufacturers can cost upwards of $3. Batteries made in China will cost less but often come with some serious performance drawbacks. Given that a high-end smartphone has a BOM near $200, that makes the battery cost a visible line item on the list of components. Naturally, this attracts attention, scrutiny and further examination of where the cost curve has been, and where it is headed. The next chart shows the pricing trends that the industry has been subjected to. As deployment of batteries accelerated driven by demand in both the mobile and EV sectors, the cost of the batteries, at least for consumer devices, measured in dollars per unit of energy (Watt-hours), plummeted nearly 10X in the past 20 years. The forecast is for further decline especially as more production capacity comes on line in China. The cost curve for electric vehicles remains more recent with a modest deployment of capacity in new electric vehicles such as the Tesla Model S, Chevy Volt, Ford Focus Electric and the Nissan Leaf. Let’s further examine the curve corresponding to consumer batteries, driven primarily by mobile devices and laptop PCs. Present cost for consumer batteries hover near $0.20-$0.30 per Wh. Higher performance batteries can command substantially more. The annual production and consumption capacity for this market segment is approximately 20,000 MWh. Judging from the historic trend, it may be another 3 or 4 years before the 100,000 MWh threshold is reached. In other words, it may be another 3 or 4 years before we see these cost figures break the $0.10 per Wh mark. That is of course assuming the trend continues at its present pace. Any excess production capacity in Asia, and particularly in China, could easily accelerate the price decline. Paralleling this pricing pressure is the continued trend to improve the energy density of batteries. Over the past 20 years, the energy density has increased by approximately 2X. For the most part, the progress was incremental translating to an annual gain of about 5%. A state-of-the-art battery in a high-end mobile device may have a density above 600 Wh/l. But as energy densities continue to climb, both development and manufacturing costs are accelerating. The present material system using graphite based anodes and cobalt-oxide cathodes is reaching its limit. Research in new materials is needed. These enormous research and development costs accompanied with the large capital costs of manufacturing are reducing the field of battery vendors to a select few, notably the large chemical conglomerates based in Asia. So will the past trend of increasing energy density and decreasing costs continue indefinitely? The challenges of the past couple of years indicate that a change in this trend may be quite likely. 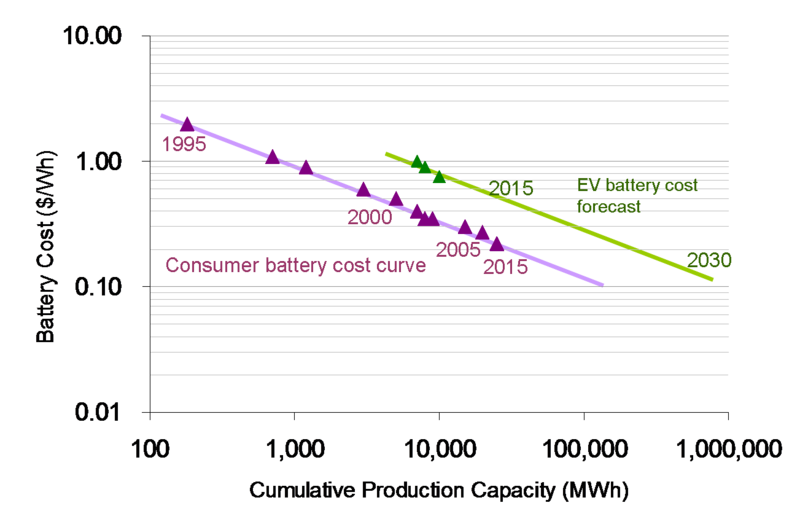 If the rising costs of developing and manufacturing new high-energy density batteries are not tamed, then expect a slowdown in the rise of energy density, and commoditization and rapid decline in pricing for lithium-ion batteries. That, folks, is the definition of an inflection point!